Well trained staff, large exercise areas, plenty of social and play time. Kennel and indoor social areas well maintained. My dog LOVES Adveture Pet. It is actually hard to keep her in the car when we make the turn on to the street. I love that my lab puppy is worn down after playing all day with the other dogs. She sleeps so soundly afterwards. I am constantly recommending this place. We love Adventure Pet! Our dogs love their excursion days and come home exhausted. We always feel they get superior care at base camp boarding while we’re away. They’re part of our family. My pups LOVE their excursions! Both the adventures and boarding are fantastic. My dog Lucy was leery to get in the van at first, but Michael was always so kind and patient with her. Now Lucy cannot wait for Michael to come pick her up for an adventure, she waits at the window for him and is always happy to see him! I had never boarded a dog before I tried Adventure Pet and can't imagine going anywhere else. The staff treat us like family and always welcome Lucy! I can’t enough good things about everyone at Adventure Pet. They care for my fur baby as I would. My dog loves going and comes home happy and exhausted from all the fun she had. They clearly put a lot of thought into creating such an amazing environment for the dogs they take such great care of. Thank you! Sent me pictures of her on her first hike. This place is first class. All the employees are fantastic. My 6 month old golden doodle loves the pool and all all the doggie play. They are so exhausted after coming here. I LOVE THIS PLACE!!! The only person Mowgli likes to wake up early for is when Marnell knocks on our door. Every-time he sees her he knows its adventure time. She also takes amazing pictures of Mowgli with all his friends! I just discovered this place a couple weeks ago. I have been taking my one year old chocolate to daycare since she was little at another place that is just fine. I switched to adventure pet because it is closer to work and I am so glad I did. My pup is thoroughly played out when I pick her up after work. She seems to really enjoy going and she is excited when we pull up in the morning for drop off. It's super clean and they have water areas for the dogs to play in. Anyone with a water dog can appreciate this. The staff is responsive and polite. I highly recommend this to people who aren't just looking for a daycare but for their dogs to actually play hard and get dirty. I can't say enough about how wonderful this place is! The facility is clean and welcoming. Everyone on staff has been super friendly. You can tell they take pride in their work and are passionate about the dogs. My sweet pup takes a little bit of time to feel comfortable around new people and places. During the initial evaluation, they made sure to slowly get him acclimated with the staff, other dogs and facility. My dog is like the Energizer bunny, but was completely exhausted after his first day at day camp. The next time I took him, he started going crazy with excitement in the car when he saw the Basecamp. I'm so glad I found this place! 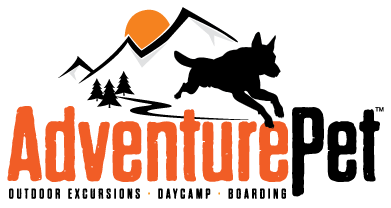 Adventure Pet also has boarding, pet training, and outdoor excursion services. Check this place out if you are looking for a place that will love and take care of your dog while you are away. Your dog will thank you! Everything! Nicest humans who love my doggos, treat them well, and take them on great adventures! A brilliant concept and a lifesaver for my very energetic pup! My dog has been to several day care facilities in town. Today was his first day at Adventure Pet, and this is the first time he’s come home and gone straight to bed after day care! 13.6 miles of running and fun in one day! Amazing job, Adventure Pet! If you have a high energy dog, give these folks a try. Mika loves Adventure Pets. She comes exhausted but happy! We dropped Reno off for the whole day to play with the other dogs and he sure is tired after we picked him up. This place is amazing and Reno will definitely be going back. Safe to say he had fun! Our first puppy training class was fabulous! Paige is wonderful, and does very well with both the pups and the owners. Great support staff, too! Hands down best boarding/daycare/outdoor excursions dog business in Reno! My German shepherd is needy and has severe separation anxiety but stayed at base camp for a week without issues and seemed sad to leave when I came to pick her up! Their facility is gorgeous and the dog pool perfect! The staff and owners are amazing, responsible, professional, and they really care about your dog! I won't be boarding her anywhere else ever! She already does weekly outdoor adventures / excursions with them, which she LOVES! So glad I found these guys! Highly recommend this place! We were looking for a way to wear out our 7month old Golden but weren't ready to send her out on the field trips. Adventure Pet has an amazing custom built daycare with a wonderful group of dog sitters, activities and all the love and attention you give your own doggie. I'm writing this review because your dog deserves the best and if you love your baby as we do ours, this needs to be on our list of daycares to visit. I'm holding back from telling you of all the features and benefits you will find at Adventure pet. As I fear If everyone knows about this place I'll never get a spot. Until then they take walk-ins but your doggie must past an assessment test before being admitted. PS... Brittain is exhausted for 24 hours after a day at Adventure pet, I wonder if I can drop off a toddler?